Why 8-week sessions? Can I just try it out? We value teaching in a progressive learning environment where you can learn more, and quicker, with a group of peers. Drop in classes are challenging to maintain an appropriate curriculum that is new and challenging for everyone as there can be different people in class every week with this policy. Therefore, we highly suggest our 8-week session classes! However, we do have a Saturday 11am drop in aerial basics class. It is not age specific, meaning the class will likely have adults and kids. If you don’t have aerial experience, you should start in Aerial Basics 8-week session to “learn the ropes.” You’ll get to try most of our different apparatuses, learn the basic techniques, and begin to develop the muscles and flexibility needed to progress. 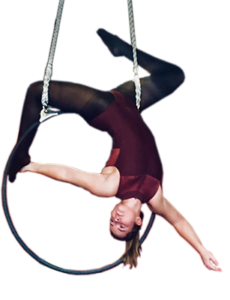 The most time gets spent learning on the fabric (silks), but you will also learn trapeze, lyra (hoop), and sling (hammock)! These classes are tailored to a beginner level. No experience is needed. Are classes for any age? All our classes are age specific. We have classes that are age specific for our youth (ages 6 to 8), pre-teen (ages 9 – 12), and teen (ages 12 – 18) students. These classes are in what we call a “term” format, meaning they run from January through May (Spring term) or September – December (Fall term). For more info on these terms, go to the classes tab and find youth, pre-teen, or teen. Our adult classes are on an 8-week session format. Some, such as adult aerial basics are 18+. Other more advanced adult classes are 14 years or older. Please wear leggings and have a shirt or light jacket that covers your arms if needed. The trapeze and hoop specifically can scratch the backs of your knees, so legging are best! Please do not wear jewelry of any kind (it can snag our fabrics and is NOT fun if it gets accidentally pulled out!!) or clothing with zippers or other things that could get caught on the fabrics. Yes! Our studio is the safest in Denver which sets us apart from our competitors! It was created by the structural engineers who designed RTD Denver to maximize safety. We also have a built-in, set-level, padded floor specifically for aerial arts and have additional gymnastics certified mats that we place under every apparatus when in use. Additionally, our instructor to student ratio is kept small to maximize instructor supervision and personal attention. Being the largest studio in the Denver area, there is also more space per student avoiding any issues with collisions. We offer both open-gym sessions and private lessons. Open gym times can be found on our schedule here. Private lessons need to be scheduled with us, so please email us at dance@aerialcirqueoverdenver.com. Yes! We offer gift cards of any denomination. Please email us for details. Attendance Agreement: I understand that refunds are not given for missed classes. ACOD allows each youth student to make up a maximum of 3 classes within the 19-week semester. 2 make ups are allowed for the 8-week adult sessions. Students will not be able to make up more than the desiganed amount of missed classes. These make up classes vary in time and duration and may not follow the progressive curriculum of the session based classes. Holidays/School Closures Agreement: I understand that ACOD, LLC generally follows the Denver Public School District’s holiday/break schedule. The following holidays/breaks apply for Spring semester 2019: Monday Jan 21st MLK day and Monday Feb. 18th President’s day. These Monday classes will have 2 make up dates on a weekend and will be emailed to you at the beginning of the Spring 2019 semester. I am also aware that in the event of a school closure due to poor weather conditions, ACOD, LLC may cancel class. We will email you ASAP in that event and update you with the make up class options. All 8-week session classes will be pro-rated or make up sessions offered. Parent Viewing Agreement: I understand that I am allowed to view my child’s dance class from the chairs in the front of the studio. I understand that interacting with my child during class, such as taking pictures or entering the teaching space is not appropriate as it is distracting to both the instructors and students and can be dangerous.